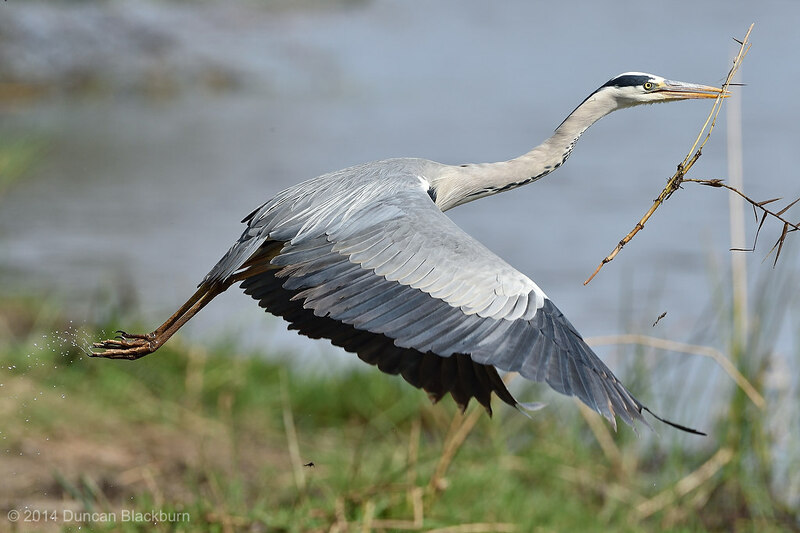 The grey heron, is a wading bird of the heron family Ardeidae, native throughout temperate Europe and Asia and also parts of Africa. It is resident in the milder south and west, but many birds retreat in winter from the ice in colder regions. It has become common in summer even inside the Arctic circle along the Norwegian coast. Its plumage is largely grey above, and off-white below. Adults have a white head with a broad black supercilium and slender crest, while immatures have a dull grey head. It has a powerful, pinkish-yellow bill, which is brighter in breeding adults. It has a slow flight, with its long neck retracted (S-shaped). This is characteristic of herons and bitterns, and distinguishes them from storks, cranes and spoonbills, which extend their necks.